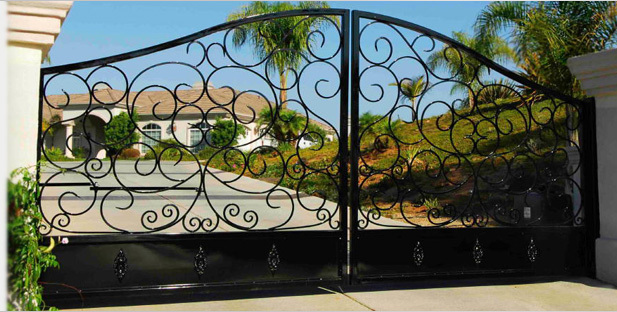 Are you looking to have a driveway or walkway gate installed? Would you like to add an opener or automation system to your current gate? We are an authorized service center for GTO gate systems. Visit out online showroom, then call us today for a quote! We recommend the Liftmaster Elite Series CSW200UL (Swing Gate) & SL3000UL (Slide Gate). These are incredibly dependable systems! Driveway gates can be controlled from a wireless transmitter in your car, and/or operated with an electric keypad giving you easy access and protecting the safety of your home. Walkway gates make it possible for owners and guests to have quick access while keeping others out, and keeping children out of unsafe areas, such as a pool or a street. Gate openers can be programmed to open and close gates when cars approach, on a timer, or even be fitted with a solar panel to ensure functiionality during a power outage.